Provides the easiest way to expand your connectivity for your desktop or laptop. 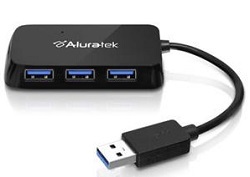 The 4-Port USB 3.0 SuperSpeed Hub with Attached Cable from Aluratek provides the easiest way to expand your connectivity for your desktop or laptop. With the ever-increasing number of USB devices such as MP3 players, printers, scanners, and external hard drives, you always need more USB ports for your computer. With Hi-Speed USB 3.0 at transfer rate of up to 5Gbps, you will able to transfer or backup your MP3s, digital photos, and digital videos in no time. The 4-port configuration allows for easy expansion and addition of USB devices to your laptop or PC. High-speed USB 3.0 with data transfer rate up to 5 Gbps is 10 times faster than USB 2.0, letting you make backups and access your content faster. Allows 2 SATA 2.5"or 3.5" hard drives (HDD) or solid state drives (SSD) to be connected simultaneously to a computer through USB.